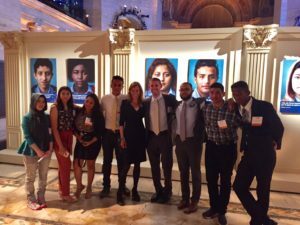 Children were center-stage at KIND’s 2017 Coming Together for Children Alone Annual Gala, where 350 KIND supporters and other friends from across the country celebrated the dedication of partner firms and corporations which have donated thousands of hours of their time to represent unaccompanied children in deportation proceedings. All the honorees provided extraordinary assistance to these children and helped ensure they had a fair chance to gain U.S. protection. 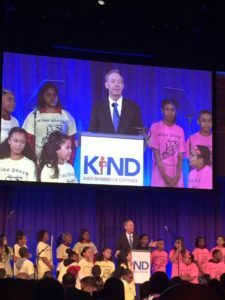 Exelon Corporation received KIND’s Innovation Award; KIND’s Allegiance Award was given to three outstanding law firms: Latham & Watkins, Munger, Tolles, & Olson, and Proskauer Rose. The world-famous PS22 Chorus complimented the Voices’ students’ stories with their own terrific singing voices, performing three songs from their impressive repertoire. Smith and KIND President Wendy Young presented the Innovation award to: Tom O’Neill, Senior Vice President and General Counsel, Exelon; and the Allegiance Awards to Matthew Thurlow, Counsel, Latham & Watkins; Adam Lawton and Josh Patashnik, associates at Munger, Tolles, & Olson, and Bill Silverman, Partner, Proskauer Rose. Jane the Virgin actress Azie Tesfai gave the evening’s keynote speech. She described the many efforts her mother made to try to stay in United States and not be returned to Ethiopia and the war there. After working very hard and exhausting all the options she could access she was about to return, when a woman at a hospital where she worked helped her find and pay for an attorney. As Azie said, “I don’t think anyone would have guessed that she would eventually start one of the first mental health clinic facilities in the U.S. and expand nationally, providing extensive medical treatments and employing thousands of Americans. “As I listen to my mom recount her journey here, I see that even she is shocked by the manifestation of all of her blessings in this country, that all started with that one woman who hired her and backed her getting an attorney to stay. Watch videos from the event here.